broken wrist is often caused by a fall onto an outstretched hand when attempting to break a fall. You may have a broken wrist if you have experienced a similar impact to the hand, wrist or forearm and are experiencing symptoms that are typically associated with broken bones. You should seek medical attention right away if you have numbness or swelling in your hand, or you have trouble moving your fingers. The only way to tell for sure if your wrist is broken is through an examination by a medical professional, including an X-ray. Don’t delay! Failure to treat a broken wrist right away may cause the bones to heal improperly and can prolong the pain. Broken wrists, or Colles’ fractures, are the most common fracture of the arm. They occur when the larger of the two forearm bones breaks near the wrist on the thumb side. Activities that put people at risk for broken wrists include in-line skating, skiing, and biking, although anyone who falls onto an outstretched hand can break a wrist. Elderly people who are prone to falls and have osteoporosis have a high risk of breaking their wrists. If you have broken your wrist, your physician will usually secure your arm in a splint until the swelling goes down. 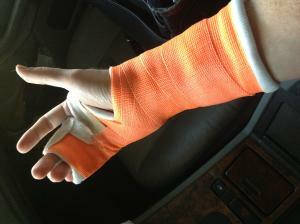 After about a week, the splint will be replaced by a cast, which you might need for six to eight weeks. You may need to have multiple X-rays to make sure the bone is healing properly. It is important to have your broken wrist attended to as soon as possible.Fortunately, the medical professionals at FastMed Urgent Care are ready and able to examine your broken wrist, reset the bone if necessary, and secure it in a splint. Even on the weekends or after typical business hours, we can treat your broken wrist. We are open 365 days a year and have extended weekday hours for your convenience. Our state-of-the-art facilities are equipped with digital X-ray machines so that your evaluation and treatment can be handled in one stop. 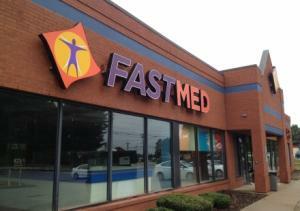 “The urgent care center was terrific! The staff delivered exactly what I needed: professional care and personal attention – and they delivered it with care and kindness. Urgent Care is on my radar as an integral part of my community and I have given several enthusiastic recommendations to friends and work associates. Thank you!” – Gayle C.